Plymouth locomotive Katie waits to pull a train from Ardenwood Station. July, 2018. 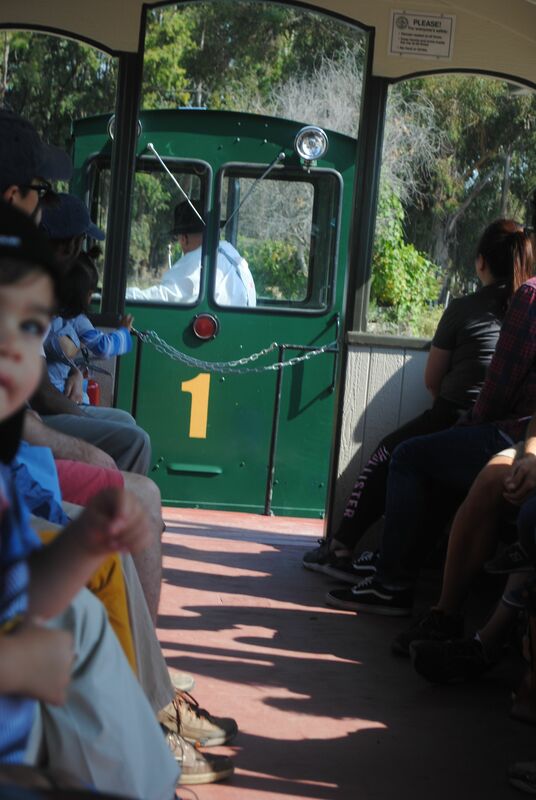 Being in the East Bay one Sunday, we visited Ardenwood Farm and took a ride behind their Plymouth locomotive, Katie. Katie pulled two nicely painted picnic cars. The handicapped car had dry rot, so it was being worked on. I had seen the flier for the 2018 Labor Day Railfair. It said "For this year only, a steam engine will not be pulling the public. 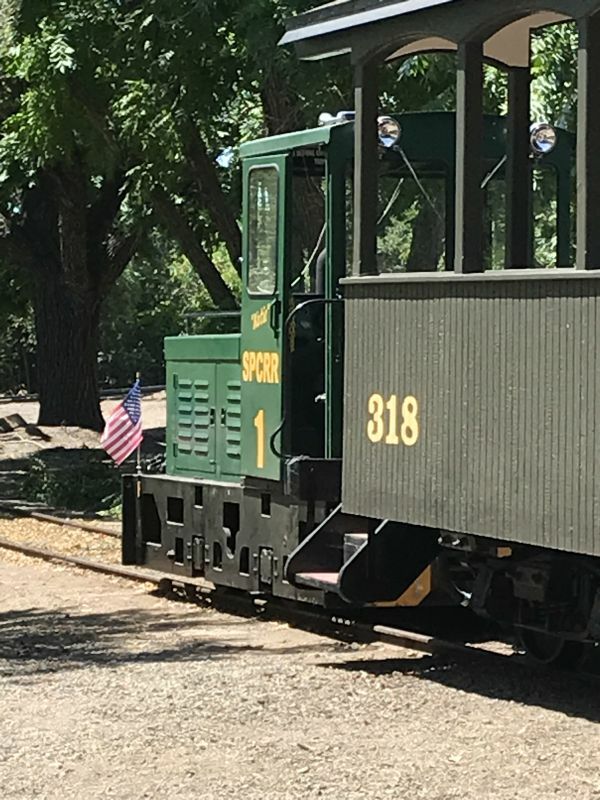 An 1890 Porter steam locomotive, Cortez Mining Co. #1, the 'Ann Marie,' will be pulling a demonstration train for everyone's viewing enjoyment and great photo opportunities." 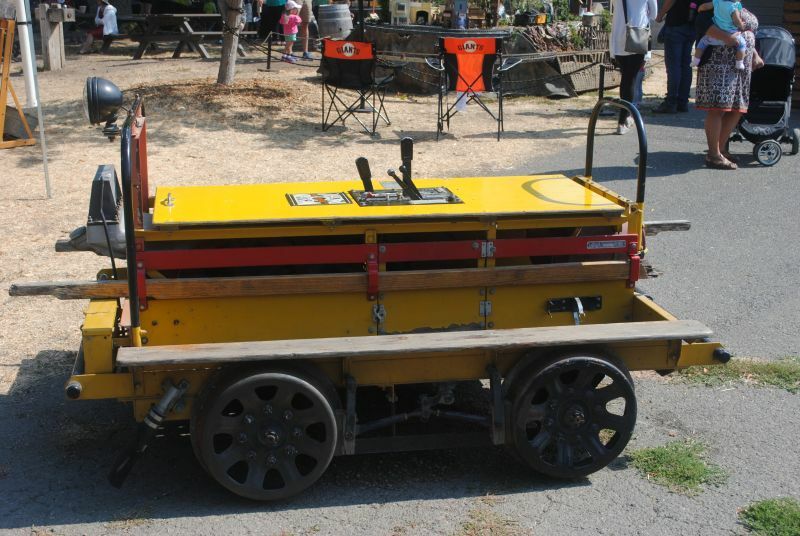 The brakeman on our car said that they can't give rides behind the Porter steam locomotive for the Labor Day Railfair this year for legal reasons. They are rebuilding the runaround track at Deer Park Station. Later in the week, I learned that the SPCRR had run afoul of state rules about carrying the public. 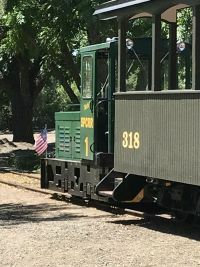 The visiting steam locomotives have been private restorations, often with original safety apparatus. SPCRR is working on a solution for next year. Katie pulls a train from Ardenwood Station. 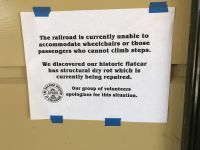 A sign explains that the handicapped accessible car will not be available. July, 2018. 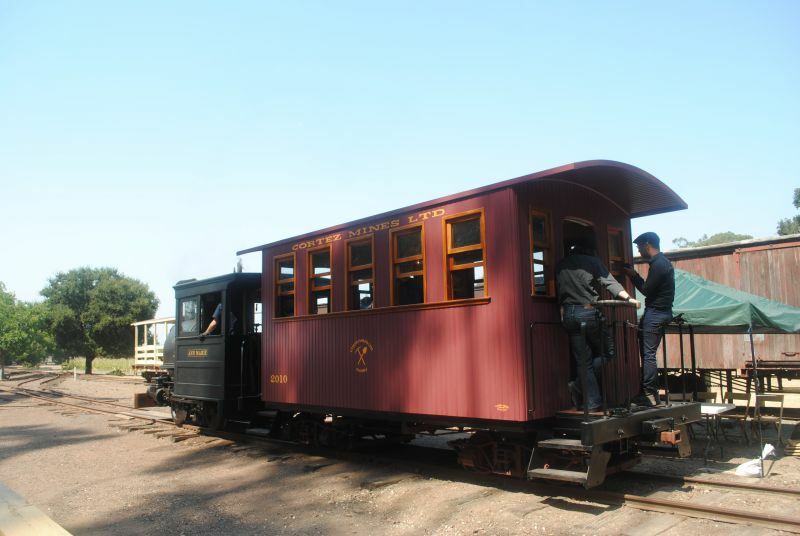 Ann Marie, an 1890 Porter 0-4-0T, was there for the tenth straight year. September, 2018. 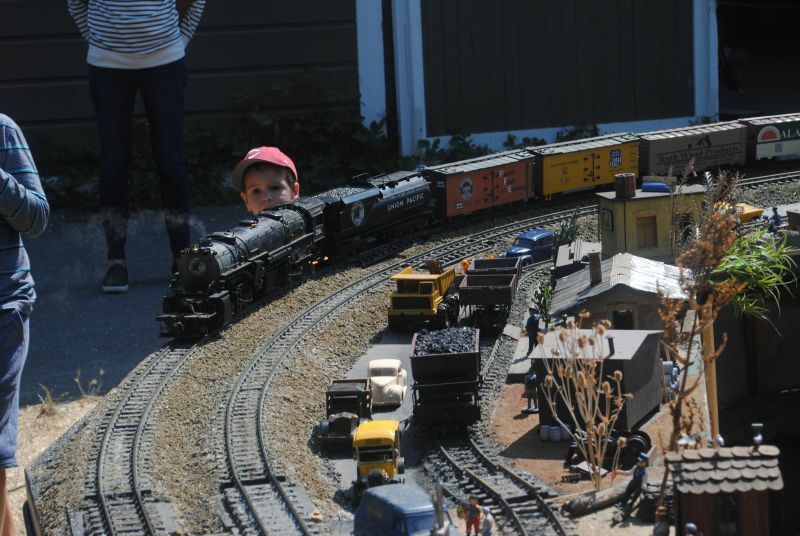 On the Sunday of Labor Day weekend, we went to the 19th annual Washington Township Railroad Fair at Ardenwood Farm in Fremont. The weather was pleasant, with a breeze that kept it from getting too hot. Turnout was good this year. 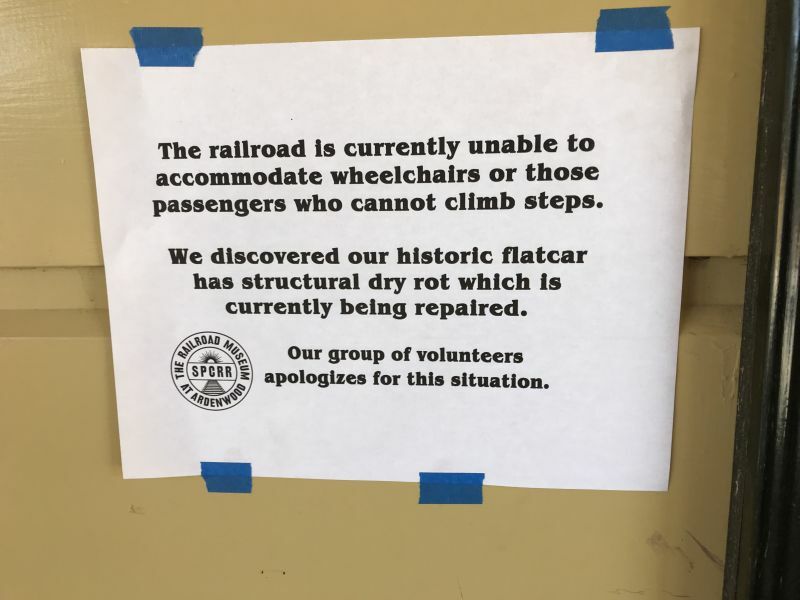 A brakeman said the train had 2000 riders yesterday. 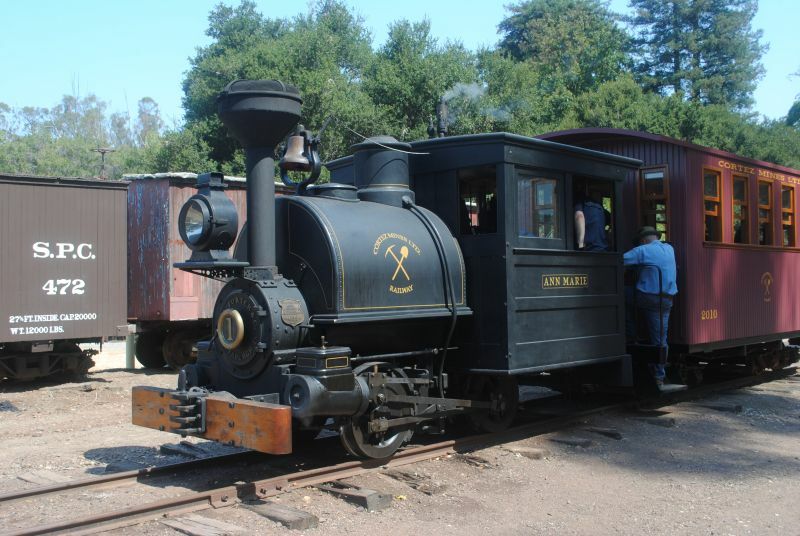 We saw 1890 Porter 0-4-0 Ann Marie push a newly built coach into Ardenwood Yard. Ann Marie could not pull a passenger train for the public this year because of issues about some state rules. They hope to resolve the situation for next year. 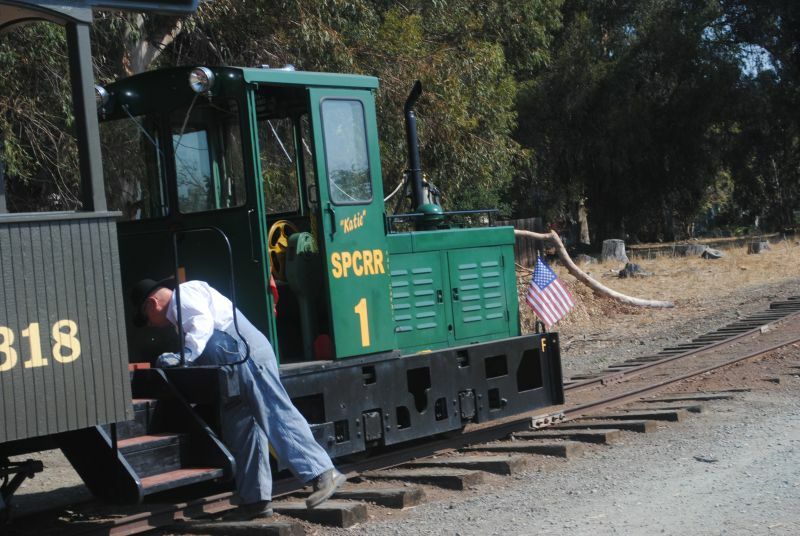 Ann Marie made some demonstration runs between Ardenwood Station and Deer Park. Plymouth locomotive Katie pulls her train toward Deer Park. September, 2018. Plymouth locomotive Katie has just pulled a two-car train into Deer Park. September, 2018. 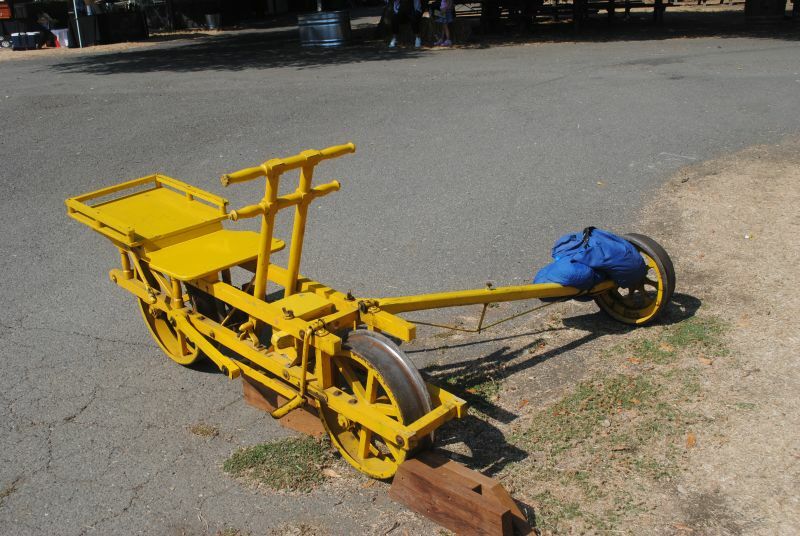 A track velocipede on display at the farm yard. The operator makes it go by pumping the handle back and forth. September, 2018. 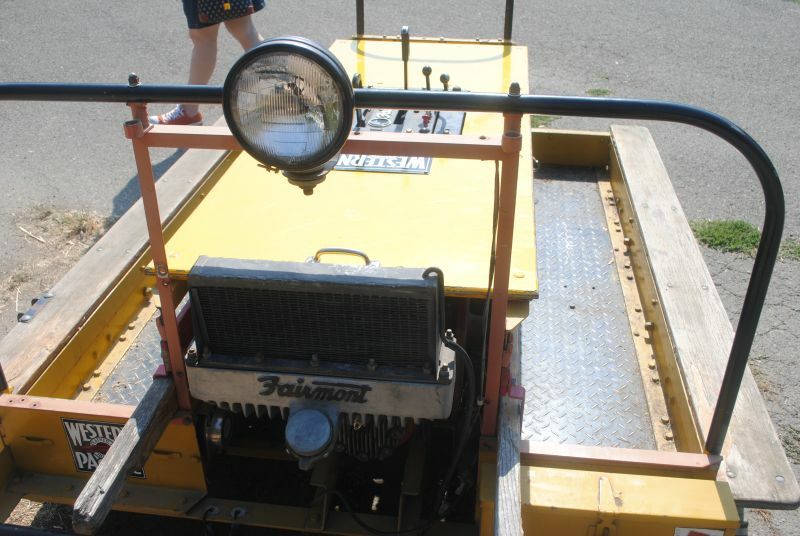 A Fairmont Speeder was also on display at the farm yard. September, 2018. A front view of the Fairmont Speeder. September, 2018. 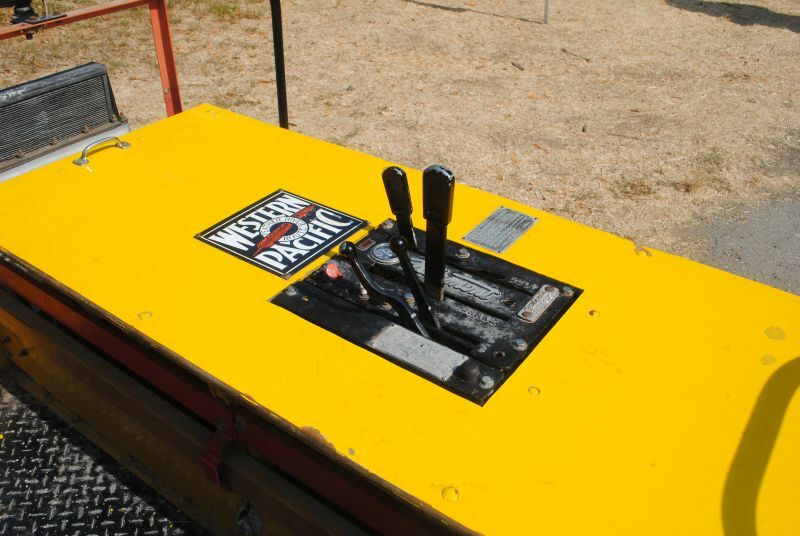 The controls of the Fairmont Speeder. September, 2018. 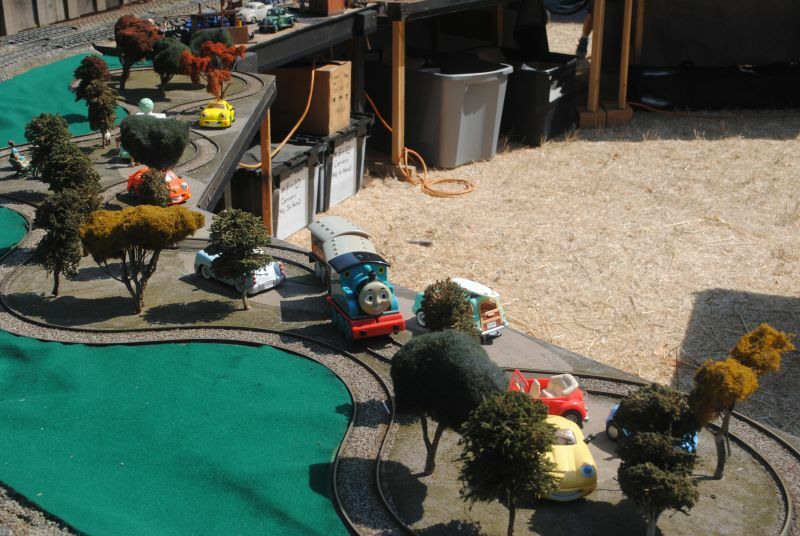 Thomas the Tank Engine, Annie and Clarabell had their own loop ot track on the garden scale exhibit. September, 2018. A Mallet pulled a heavy freight train around the garden scale exhibit. September, 2018. Ann Marie brought a newly built coach. September, 2018. Ann Marie pushes her coach into Ardenwood Station. Katie pulls a train into Deer Park Station. Here is the flier for the 2018 event. Copyright 2003-2018 by Joe Thompson. All rights reserved.